An active star-formation region in the Orion nebula, as seen by Planck. This image covers a region of 13x13 degrees. It is a three-color combination constructed from three of Planck's nine frequency channels: 30, 353 and 857 GHz. New images from a European space telescope have revealed astunning glimpse into the forces driving star formation in our galaxy. The images were taken from the European Space Agency's (ESA)Planckspace observatory and give astronomers a new view into the complex physicsthat shape the dust and gas in our Milky Way. In these new images, Planck probed two relatively nearby star-formingregions within our galaxy. Planck's first new image reveals much of the constellationof Orion, home to the well-known Orion nebula that appears as a bright spot tothe lower center of the view. The Horsehead nebula, so-called because at highmagnifications its pillar of dust resembles a horse's head, stands out justright of the photo's center. The Orion region is a cradle of star formation, some 1,500light-years away. It is famous for the Orion nebula, which can be seen by thenaked eye as a faint smudge of pink. The giant red arc of Barnard's Loop is believed to be theblast wave from a star that exploded in the Orion region approximately 2 millionyears ago. The bubble it created now stretches about 300 light-years across. In contrast to Orion,the Perseus region is a less vigorousstar-forming area, but there was still plenty for Planck to observe. 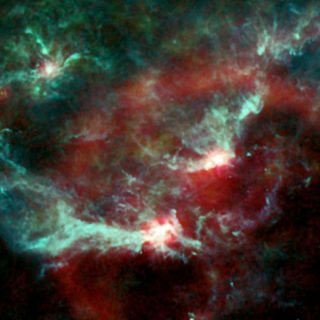 "Because Planck is mappingthe whole sky, we can capture mosaics of huge regions of the Milky Way,"said Charles Lawrence, the NASA project scientist for Planck at NASA's JetPropulsion Laboratory in Pasadena, Calif. "We are seeing the coldestmaterial in star-forming regions, where stars are at the very earliest stagesof formation." Stars typically form in cosmic nurseries hidden behind veilsof interstellar dust. But the Planck observatory scans the universe at longmicrowave wavelengths, allowing it to peer through the dust at the newbornstars, as well as study the background radiation of the universe. The images show three physical processes taking place in thedust and gas of the interstellar medium. Planck has the ability to show eachprocess separately by observing them at different frequencies. At the lowest frequencies, Planck maps emission caused byhigh-speed electrons interacting with the galaxy's magnetic fields. Planck canalso pick up on spinning dust particles emitting at these frequencies. At intermediate wavelengths, the emission is primarily fromgas heated by newly-formedhot stars. At higher frequencies, Planck maps the sparse amount of heatgiven out by extremely cold dust. This can reveal the coldest cores in theclouds, which are approaching the final stages of collapse, before they arereborn as full-fledged stars. These stars then disperse the surrounding clouds. The delicatebalance between cloud collapse and dispersion regulates the number of starsthat the galaxy makes. Planck observations will help advance researchers'understanding of this interplay, since it can provide data on several majoremission mechanisms at the same time. The Planck observatory launched into orbit in 2009. It'smain mission is dedicated to observing the entire sky at microwave wavelengthsin order to map the variations in the ancient radiation left over from the Big Bangthat was thought to have started the universe about 13.7 billion years ago.